One day is not enough. 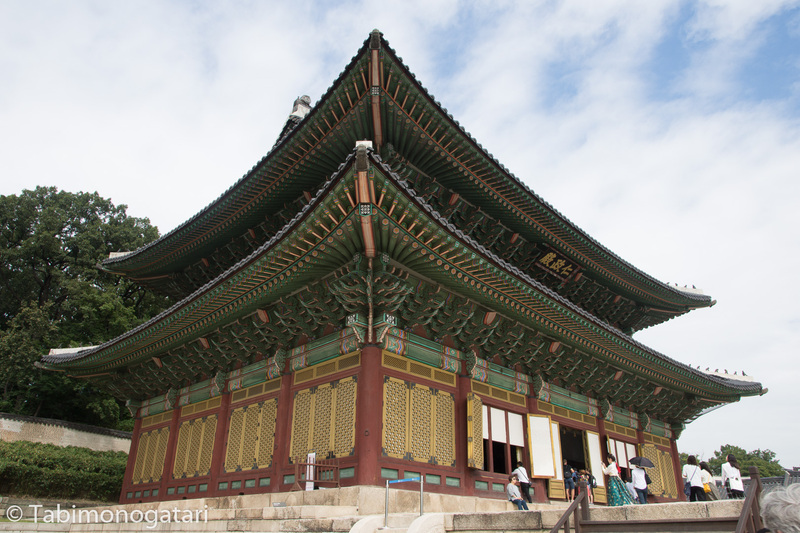 Even two days would not have been enough to catch the spirit of Seoul. Because of the Typhoon raging in Hong Kong, I was forced to postpone my flight to Seoul by one day (see last post). 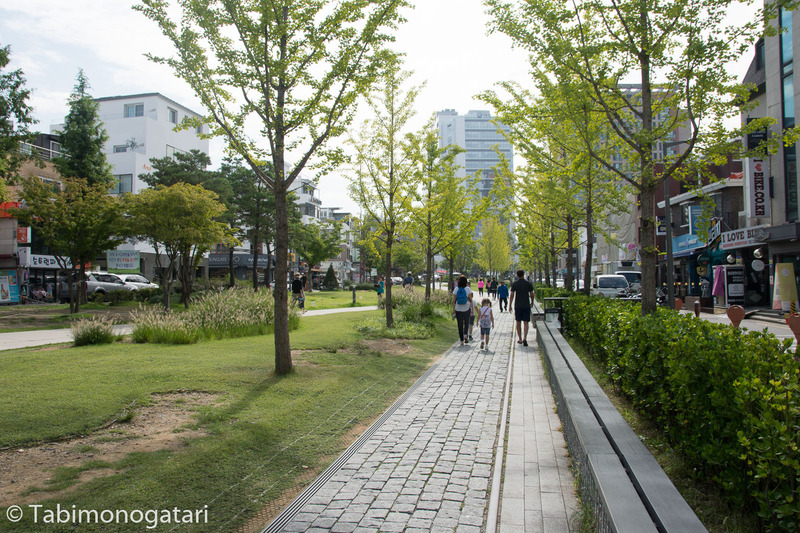 Therefore my stay in South Korea was incredible short, but I tried to make the most out of the 24 hours I had here. for its convenience and long-term serving potential became a regular activity by now. Here it’s called T-money. 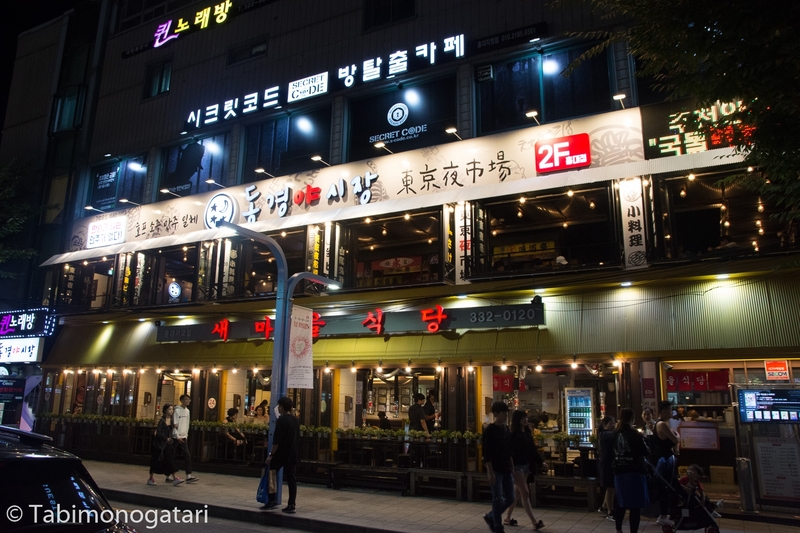 Conveniently, the airport train stopped in Hongdae, where my hostel for the night was. While far away, the train ride took an hour. The neighborhood is trendy and the fact that many shops and stalls were still open at midnight instantly convinced me of that. 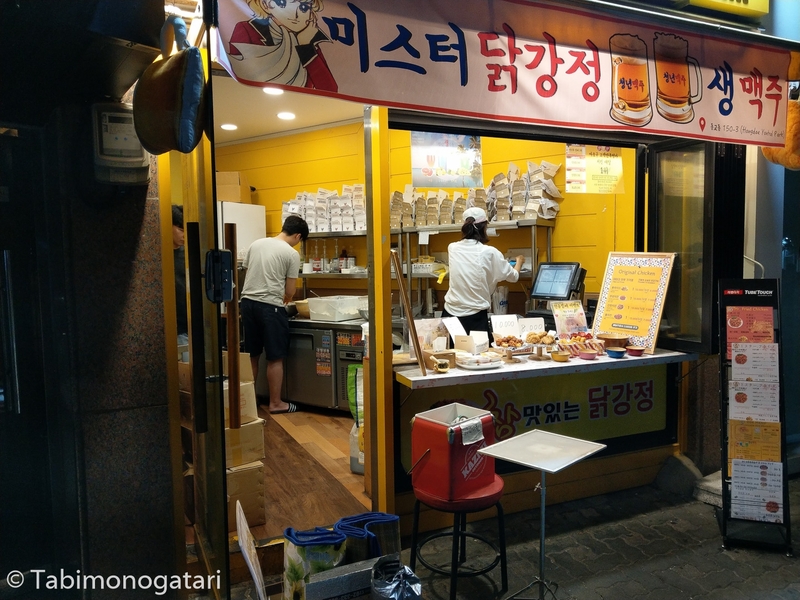 The check-in at the hostel went smoothly and I headed out again for a midnight snack that turned out to be fried chicken, also popular here. 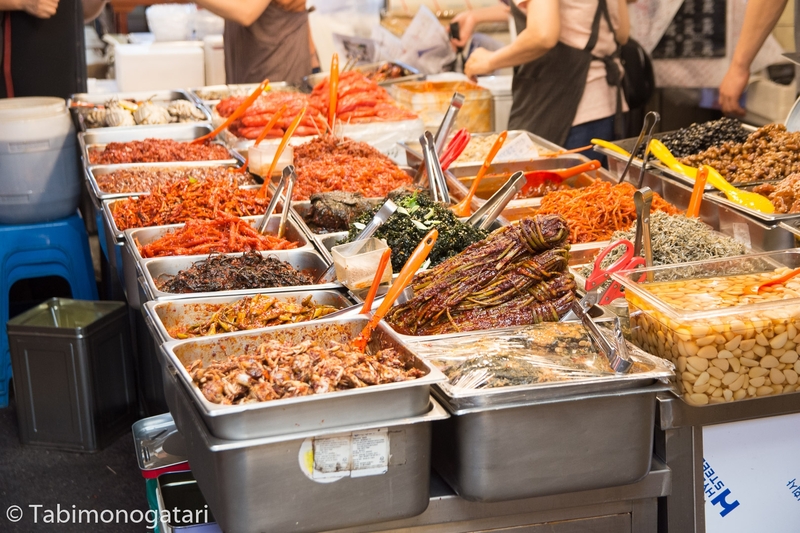 In general it can be said that Koreans love to eat. The palette of the local cuisine is far and wide and offers many delicious offers for advantageous travelers. 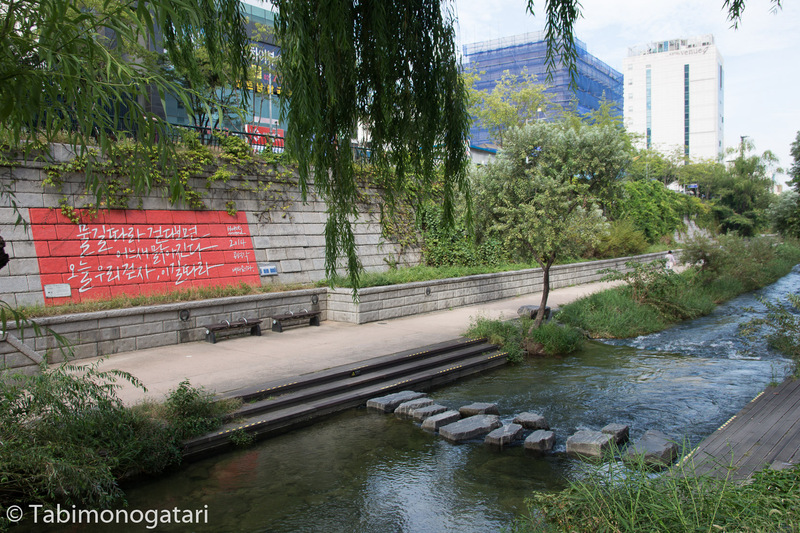 The next morning I started exploring Seoul by taking the subway to the City Hall. 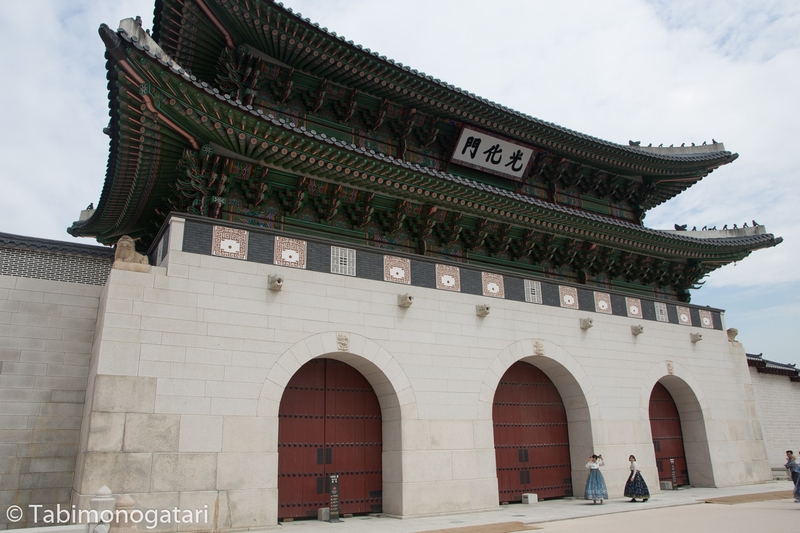 There I needed to transfer to a bus to reach the former imperial palace Gyeongbok-gung. The traffic here was intense, the major streets had five lanes and the bus drivers drove aggressively and honked a lot. Even getting of the bus was difficult. On Tuesdays the palace was closed – I found it out the hard way, but the next sight was in walking distance, so there was not an issue. 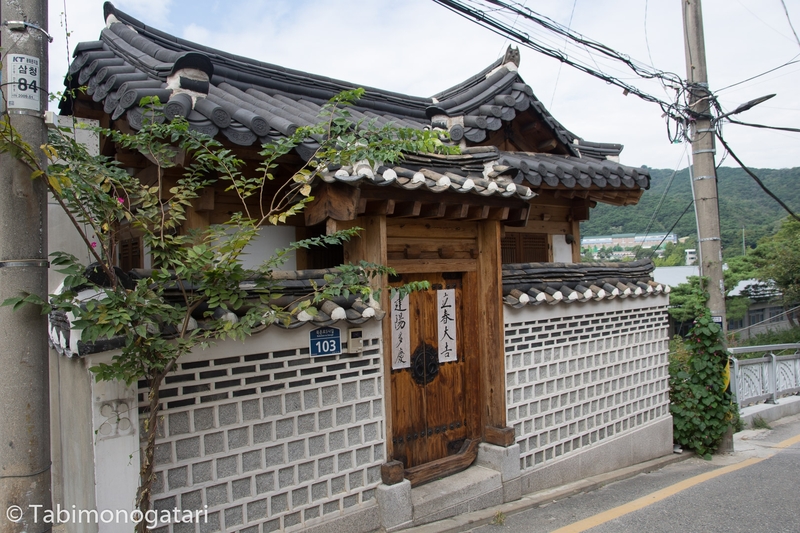 Only a few minutes away lies Bukchon, a historic neighborhood that retains some historic touch in the megacity Seoul is now. 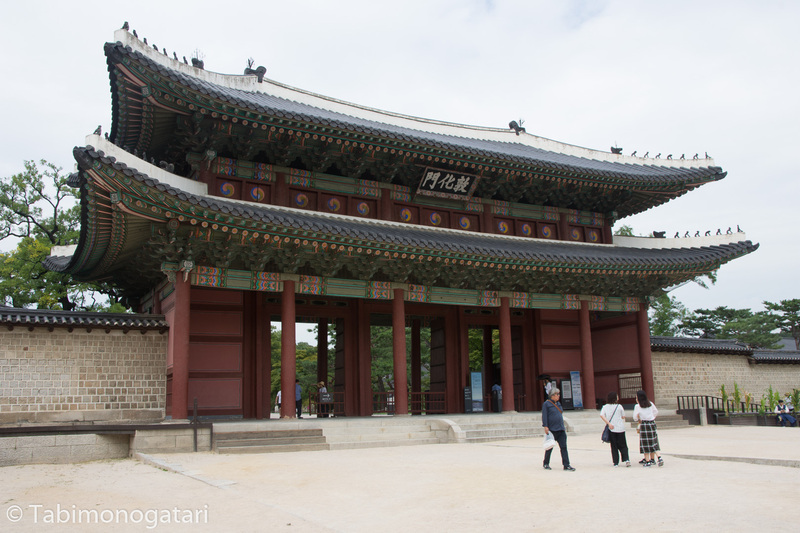 I spotted many tourists wearing a Hanbok, traditional clothing, that could be rented at many shops. 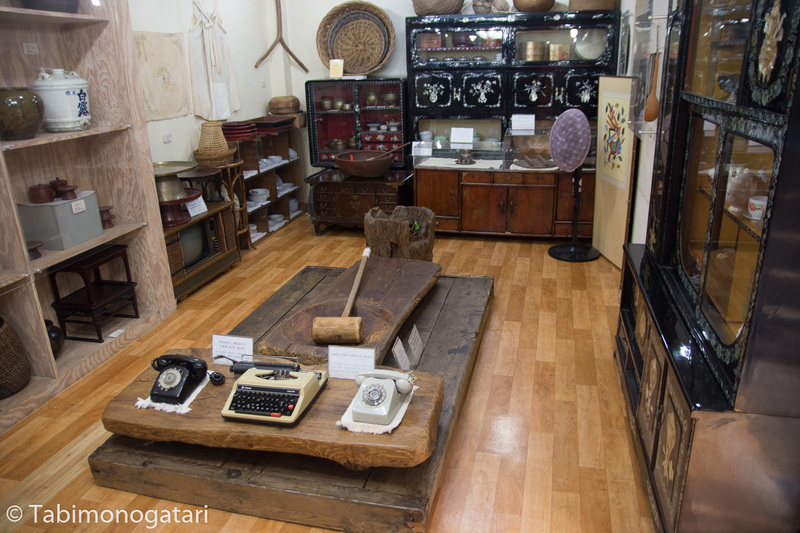 One house was turned into a museum so I could also get an impression of the inside of such an house. 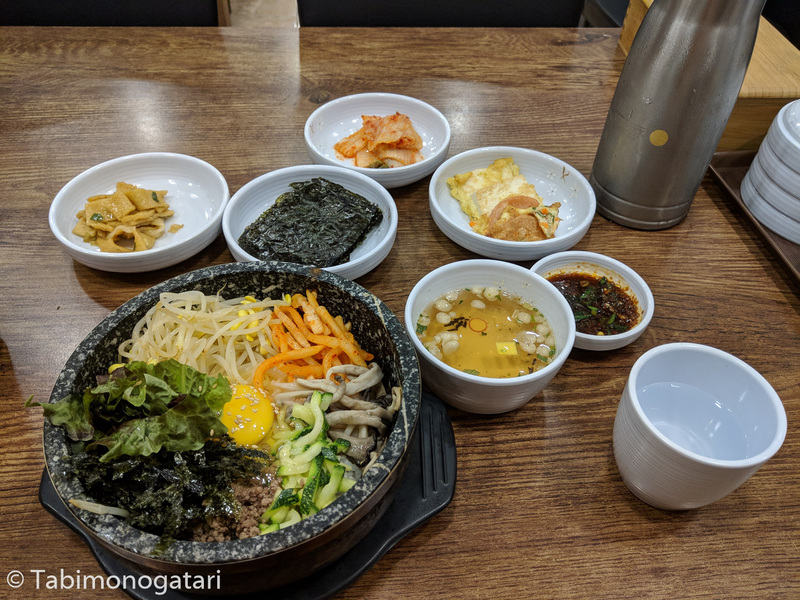 For lunch I was determined to order Bibimbap, a dish I grew to like when I tried it in restaurants at home. It is usually served in a hot stone bowl and one must mix the ingredients well from time to time so nothing gets burned. The amount of side dishes that were served alongside was incredible. One of them, kimchi, is well known around the world by now. 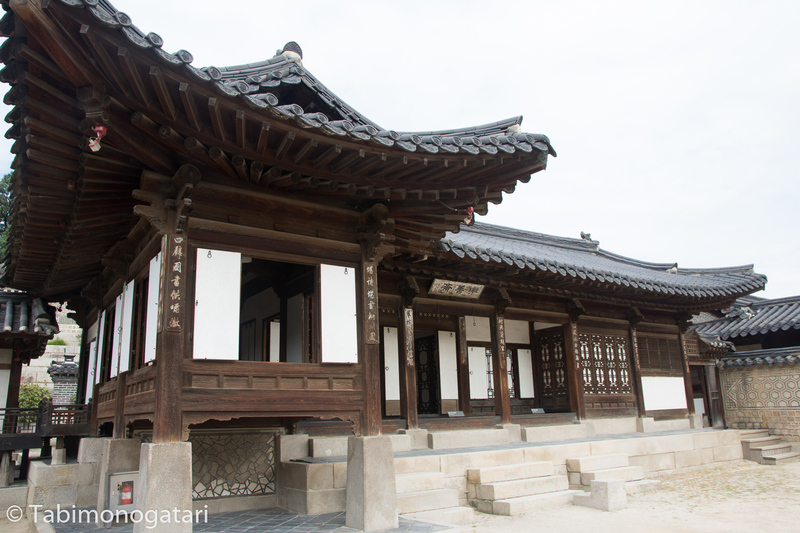 Not far away was another palace where the royal family resides from the 17th to the 19th century, called Changdeok-gung. The premises were enormous and half of it was made up by a garden behind the palace, termed the Secret Garden. 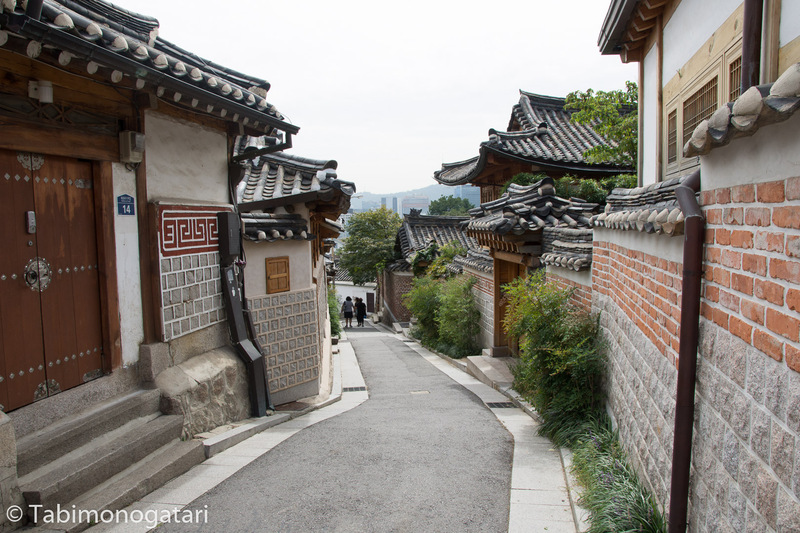 From there I continued to Insa-dong, a popular shopping street. 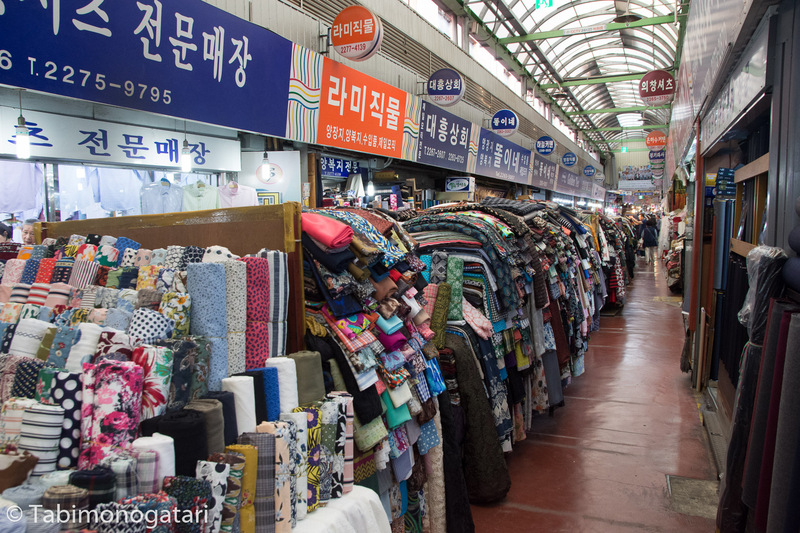 There were many souvenir shops and street shops, making it easy to find something to bring home. 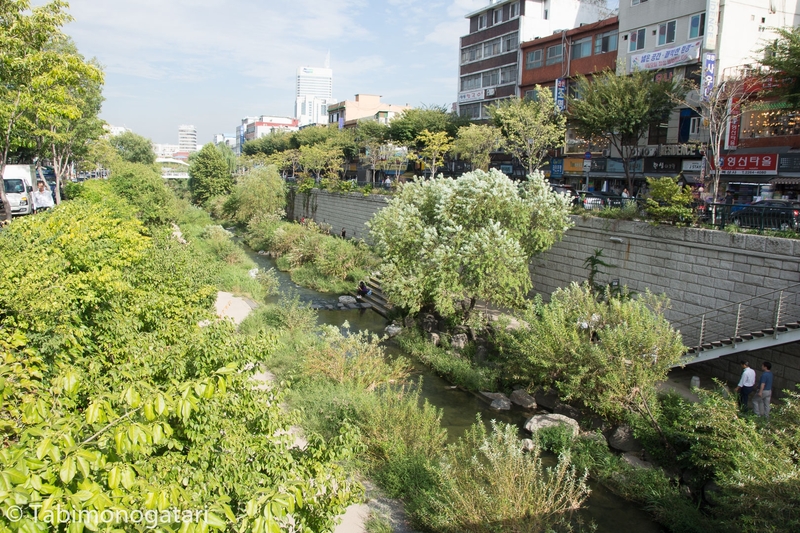 A bit further in the South, the Cheonggye Stream offers a spot of urban greenery in the midst of the bustling city. 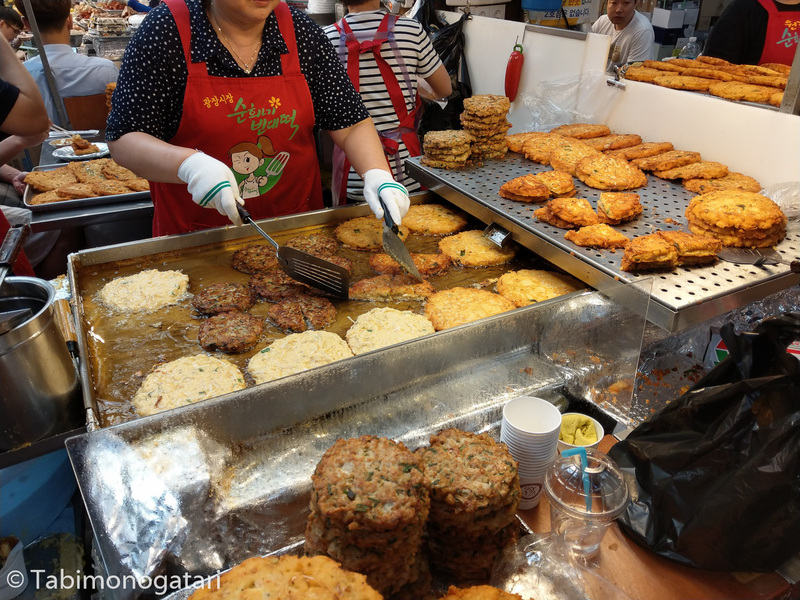 Following the stream to the East, I reached Kwangjang Market market in the afternoon that was still busy at that time. On the one side garments and clothes are sold here but the majority of the market catered towards food, both raw and ready to be eaten. 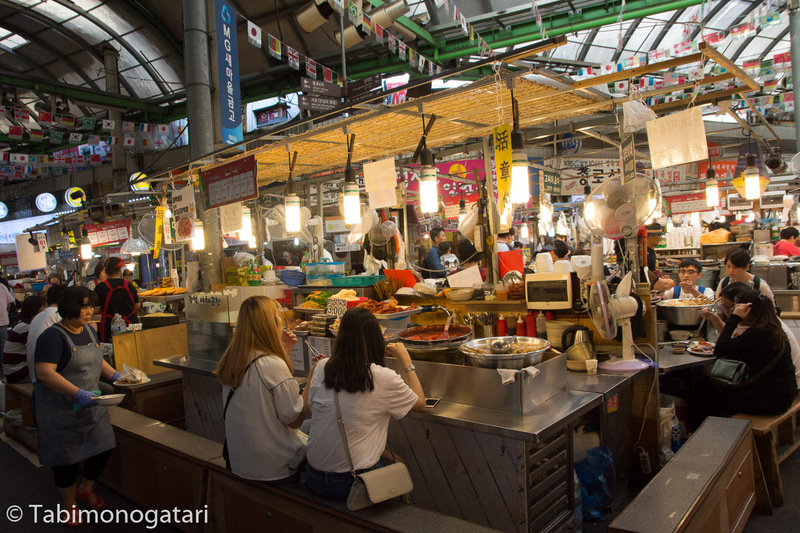 In the center of the market there were lots of stalls serving Korean specialties, such as Bindae-tteok pancakes and gimbap (which looks a bit like sushi I have to admit). 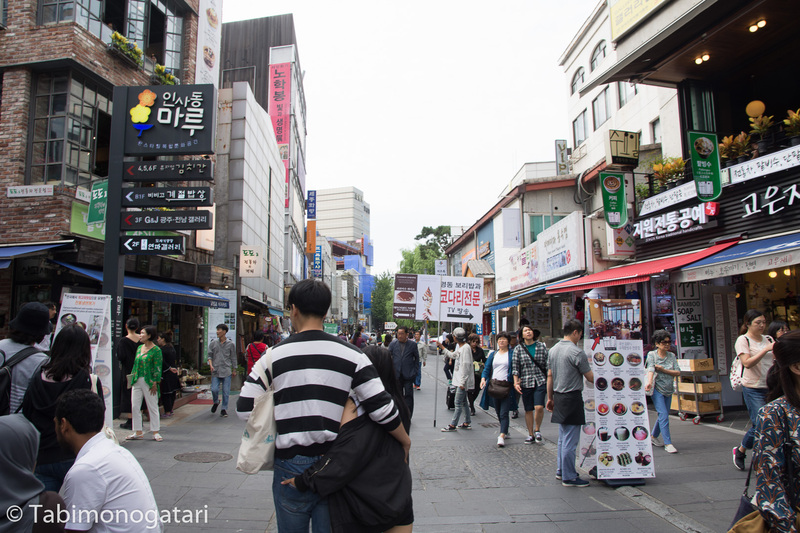 With the subway I then travelled to Myeongdong, a popular area that housed malls and fashion shops. It was rush hour, so it became quite crowded. 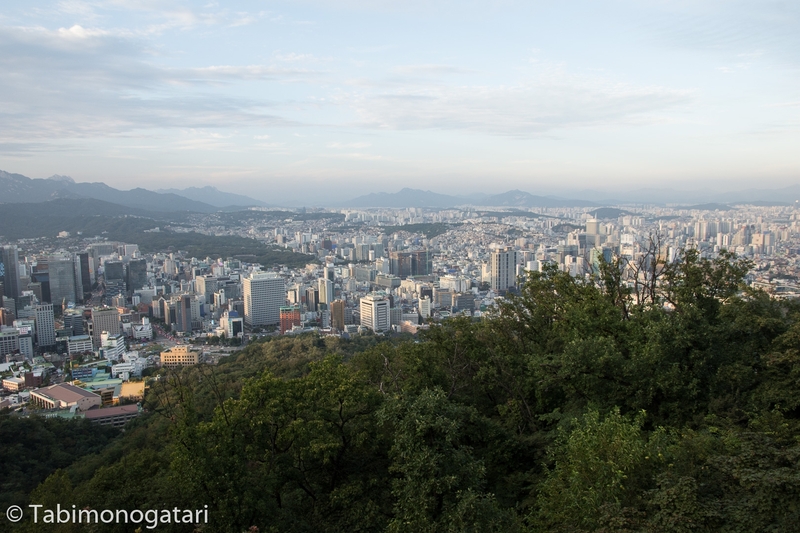 The view from N Seoul Tower, or Namsan Tower, is said to be the best in Seoul. The tower stands on a hill surrounded by a park. 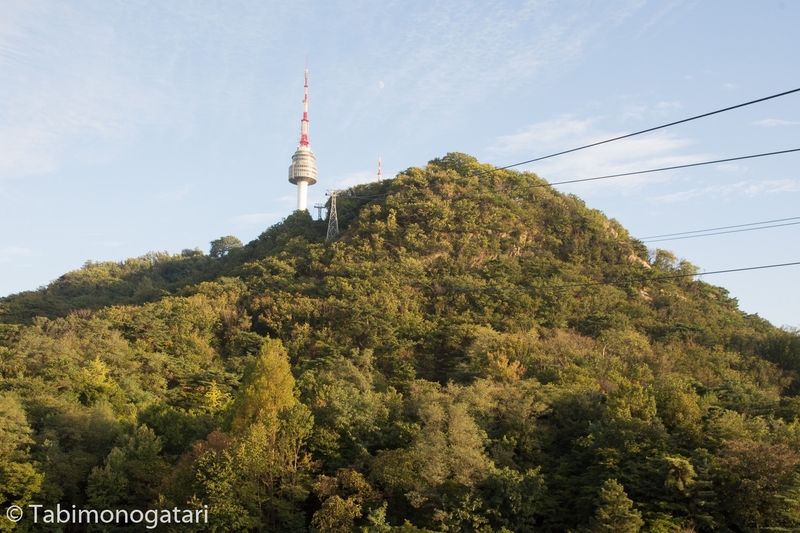 While one can hike the way up, I chose to take the cable car. It was not obvious to me to find the station, so it took me some time to find it. For political reasons (see here) Google Maps’ use is limited here, so it was not as helpful as usual. In any case, I found the way up the hill and made it to the tower before sunset. 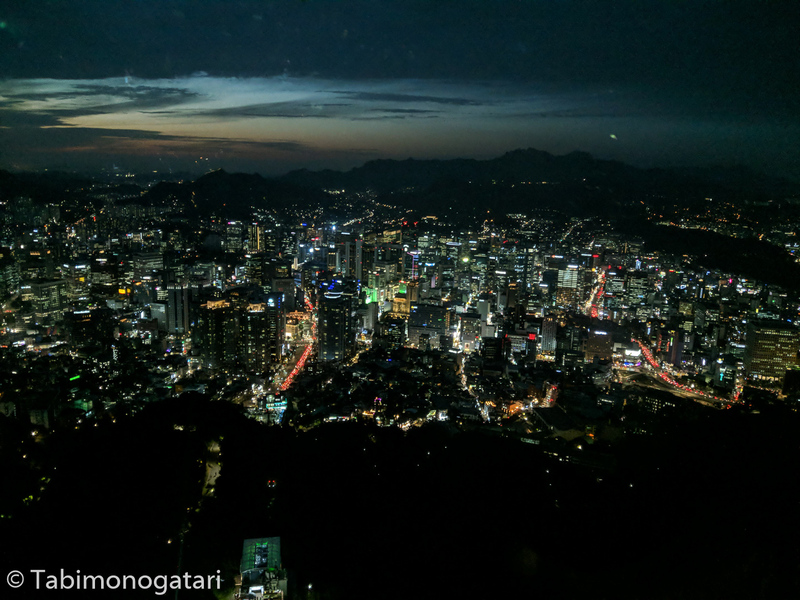 The timing was excellent, because I could enjoy the view over Seoul both at daytime and at dusk. 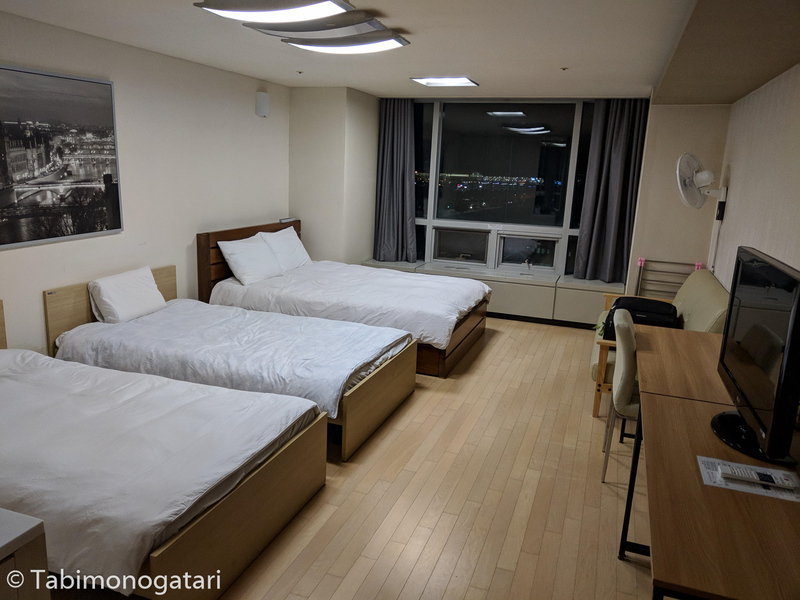 My departure flight was on the next day, but very early in the morning, so I decided to move closer to the airport for the night. 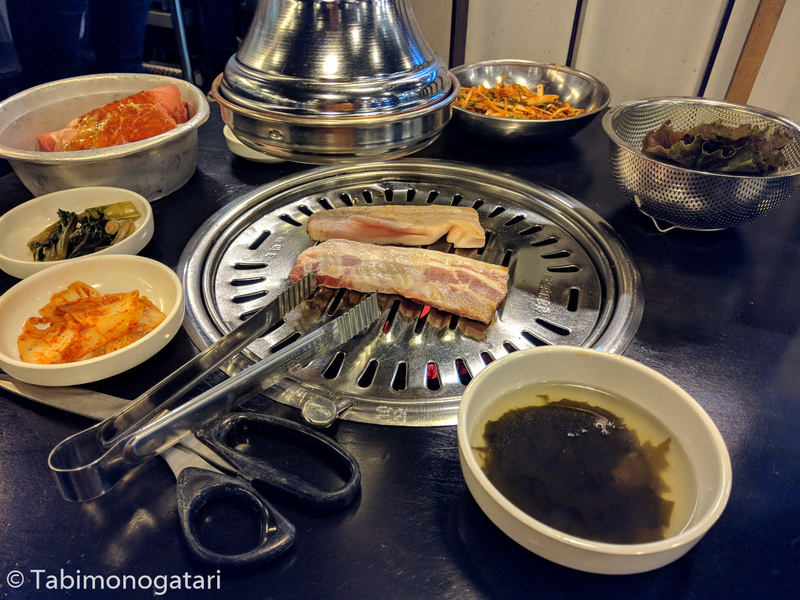 Back in Hongdae I quickly found a Korean Barbeque restaurant where I could tick off another must-do in Korea. While I knew little about the correct way to enjoy this cuisine, I enjoyed myself and tried to figure things out as they came my way. 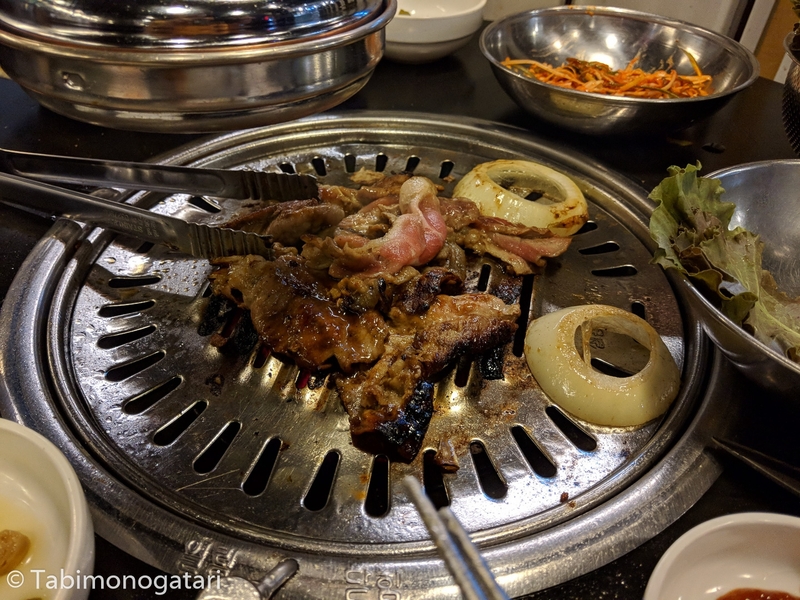 The meat was surprisingly cheap, together with various side dishes and a drink I only payed 20’000 ₩ for two types of meat. Needless to say, all of it was delicious. Close to the airport there were several apartment complexes where rooms could be rented. Past midnight I visited the convenience store downstairs to spend my last coins on snacks. The next morning I woke up at 5 am to reach the flight. 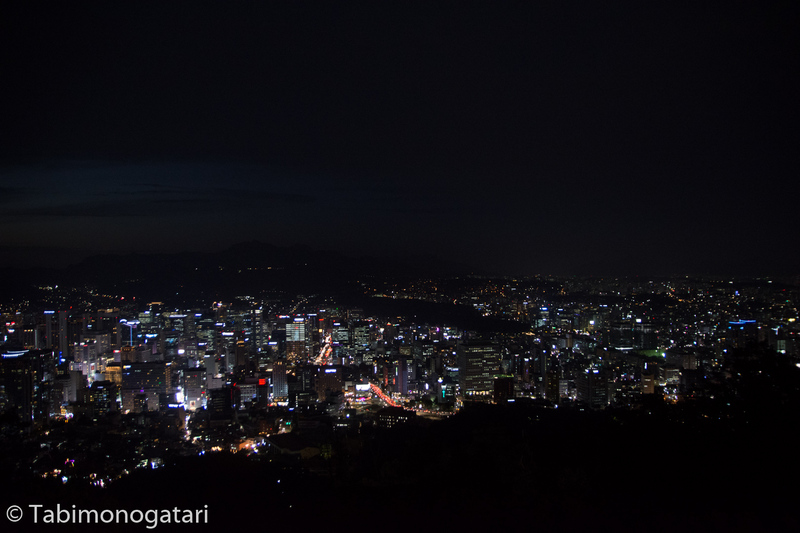 If I were to stay within Seoul it would have costed me at least another hour of sleep. 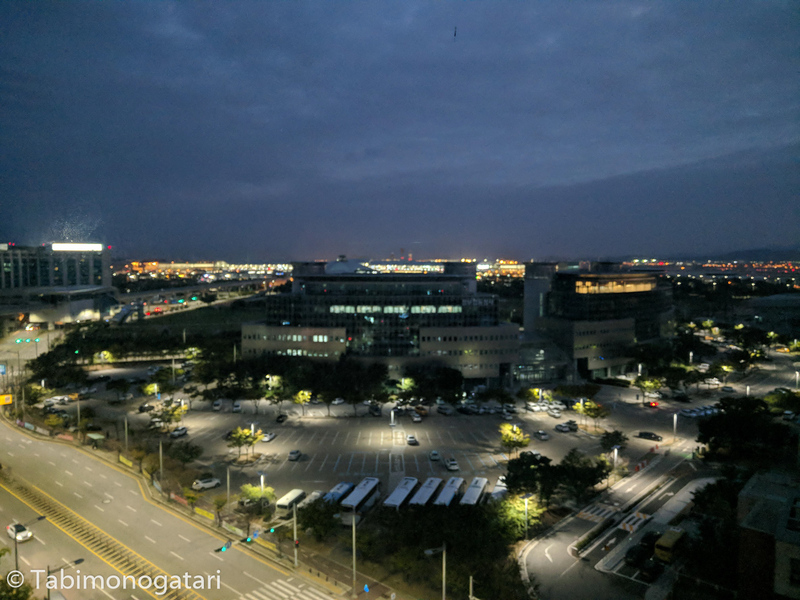 The night was short, but the view from the room over the airport at dawn lifted me up. The queue at the check-in booth was long, so I needed to rush to make it in time, but it all went well in the end. Around noon we landed in Tokyo. 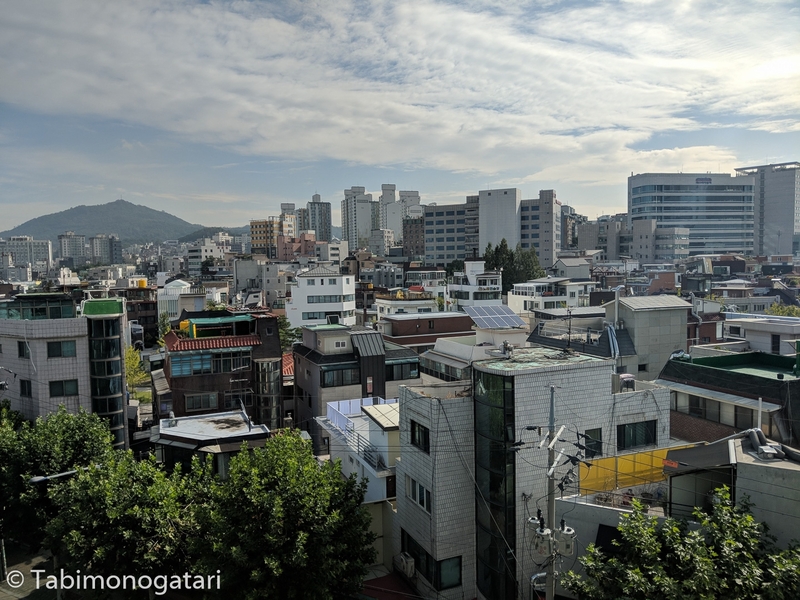 It was a very short time I could spent in Seoul, but I enjoyed every moment of it and I am sure to come back with more time on my hands. 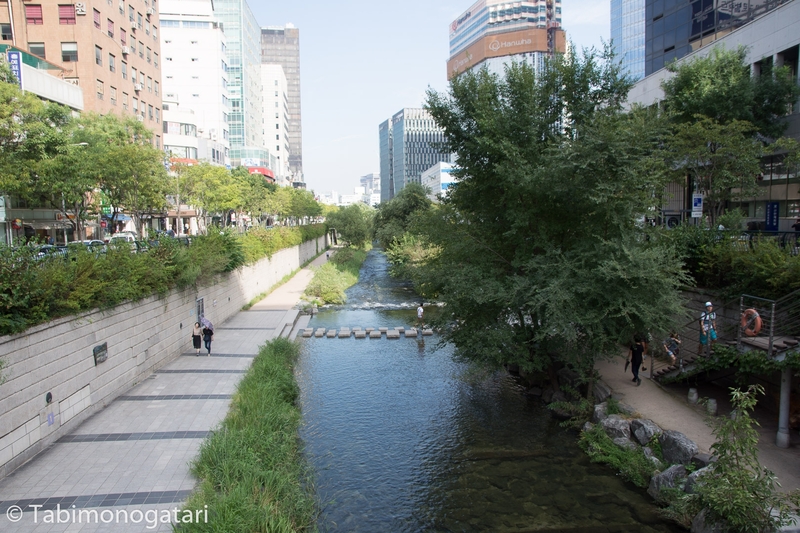 Especially the districts south of the river, including Gangnam, would be interesting to see.